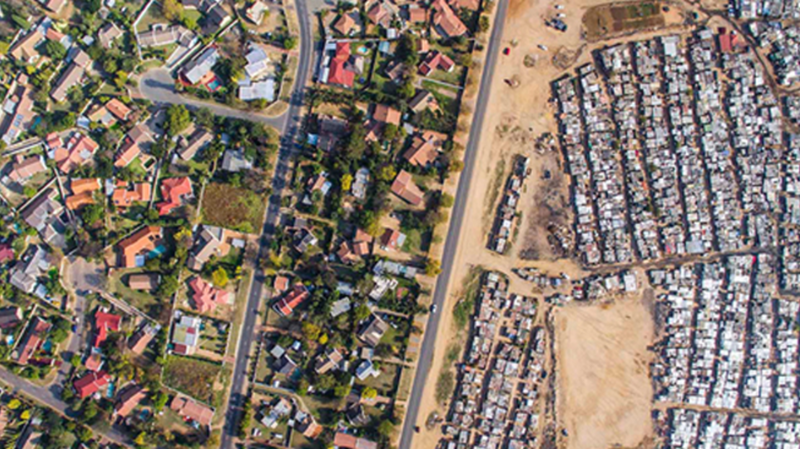 South Africa's notorious social inequality is just as striking from above. Cape Town-based photographer Johnny Miller recently shot a series of drone pictures that provide viewers with a birds' eye view of the stark segregation between rich and poor (and in many cases, black and white) communities in Cape Town, Johannesburg, and Durban. Called "Unequal Scenes," the project, recently highlighted by PetaPixel, began as a single Facebook post. Miller won a Rotary Ambassadorial Scholarship, which took him to the University of Cape Town to study anthropology in 2012. Eventually, Miller bought a drone, and he wanted to incorporate the knowledge he'd gained from his master's program into his photography. "During my coursework, we covered a lot of topics, and some of the most interesting to me were spatial planning and the architecture of the city, specifically the particular way that was done under apartheid," Miller said in a statement he shared with mental_floss. "For example, there are huge buffer zones that were created to keep different race groups separate. I just thought that was fascinating. So when I got the drone, I had a spark of inspiration that perhaps I could capture those separations from a new perspective." Miller took his drone outside Cape Town, to the boundary between the local Masiphumelele community and its surroundings—an area he calls "one of the most dramatic examples of informal settlements." He posted the resulting picture on Facebook, and it was shared more than 1000 times. The response drove Miller to take more photos of apartheid and post-apartheid urban planning in other South African cities. He eventually created a separate website for "Unequal Scenes," and is delivering a series of lectures on his work. Miller is also currently releasing a new photo a day. According to Miller, the images are "just the beginning" of a larger, interdisciplinary project in which he interviews people in these South African communities and others, pairs their perspectives, and presents his findings. Check out some of Miller's images below, or visit his website, Twitter, or Facebook for more information.